This article by “Mr. Bryant” was written initially for the New York Evening Post and was reprinted in the May 19th edition of the Friends’ Review, a Quaker periodical. It details an outsider’s visit to a cotton mill in Georgia and compares the conditions there to those in New England, which are deemed more favorable. It covers the issues of working conditions and racial politics in southern mills and, as the piece implies, draws attention to northern complicity in the enslavement of African Americans in the cotton belt. Mr. Bryant notes that African Americans were banned from working on the mill he visited because of tensions with white laborers. He also critiques the lack of educational opportunities available to southern mill workers. 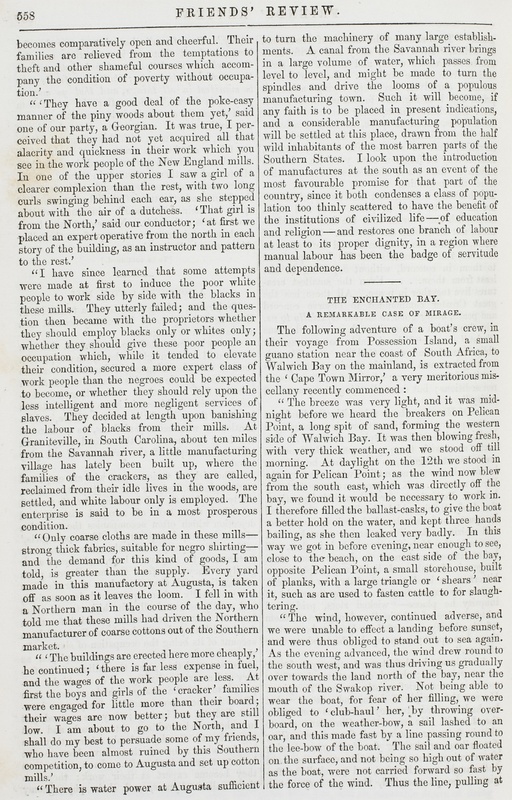 In all, this Georgia mill, its workers, and its “coarse” product are deemed inferior. Mr. Bryant, “A Southern Cotton Mill,” Mill Girls in Nineteenth-Century Print, accessed April 21, 2019, http://americanantiquarian.org/millgirls/items/show/37.